Protect valuable documents with our lockable security bank mailbag. Built tough with double-stitched seams and leather-like vinyl handles and bottom. The ideal solution for sending items back and forth between departments, branches, buildings and agents. Perfect for over sized documents. A valued product in most mailrooms, mail centers, offices and warehouse. 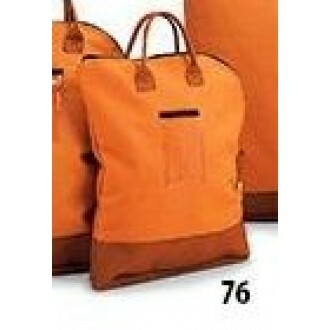 The zippered closure can be secured with optional metal padlock. Wait! - need another size, see Part 78, 24"H x 19"D security bag, click here - Part 78. • Made of rugged #8 cotton duck fabric - water repellent. • Heavy duty #5 nylon zipper on 5/8" tape with metal slide. • Metal security gomett at end of zipper allows user to add a padlock to secure mailbag. Solid plastic window allows room for an 5"H x 3-1/8"W optional address card (sold separately). See link above for optional address card.